I’m a proud Army Mom of a Paratrooper Infantryman and at the moment he’s a Private First Class in the sand box. My son’s birthday is November 18th and I turned him over to the Army on Nov. 18th 2013. Life was cruel that day. I couldn’t believe the timing. I sobbed all the way home and was inconsolable. Here I am….I survived 🙂 I admit I was not myself for months and I’m not sure I am back to where I was pre-Army days. I wrote him letters, printed funny pictures, bought funny cards and prayed. I joined an online support group for parents where I spent a lot of time. I stalked all the Facebook sights I could find looking for a picture or any tiny tidbit of info I could find. I came across some pictures that I thought were him, but maybe not so I told myself they were him to make myself fell better. We planned our trip for his family day weekend, Advanced Infantry Training graduation and his Turning Blue graduation, and his Airborne graduation. We were fortunate to live within 6 hours of the base so we could drive and not have the expense of flying. 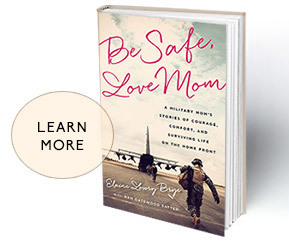 As Moms, we are used to some control and we give every bit of it up when they enlist. I started making lists of goodies I wanted to take to all of the events. I made lists of the recipes, I made lists of the ingredients. I made lists of my outfits. I made lists of everything because I could still plan and control how I was going love on him. I made friends with other Moms of sons who were in his unit. We were able to share bits of info and pictures we each found. My son was amazed I found some of the Moms of the SIT’s in his unit. Us Moms planned on meeting in person at the upcoming events. We only knew each other from Facebook so it was funny looking at people saying “is that so and so”. We talked and shared for months but couldn’t figure out in person if we were THAT Mom. My son is 3 months into his 1st deployment in an undisclosed location in the Middle East. I would gladly go back to trying to survive AIT if it would get us out of trying to survive deployments. It’s a soft preparation to what lies ahead. Find those Facebook pages, do not comment on them AT ALL. My son was only allowed 3 calls home during his AIT, but received letters. I stalked the mailman and we had a love hate relationship, haha. One day I was fresh out of the shower and I heard the mail truck. It was winter and particularly cold that day. I grabbed my fuzzy bathrobe, towel on my head and ran to the door, my hubby’s boots were there so I hurriedly slipped them on. I was a sight to see:-). Hang in there and don’t think if you haven’t received a call in weeks that your soldier doesn’t love you. Trust me, after all the grueling training, yelling and sleep deprivation they go through, they will call home when allowed.